When you call on me to draft a contract, review a business agreement, or build an estate plan, I work meticulously to ensure that your best interests are well-protected. If it’s a more pressing legal issue that brings you to my door — for instance, if you’re involved in a lawsuit — I have the knowledge, tools, and experience to fiercely litigate on your behalf. Practicing law combines some of my greatest passions — solving problems, thinking outside the box, continuously learning new things, and, of course, helping others. When a client brings me a complex case, I am all too happy to create a solution that takes the best advantage of it. 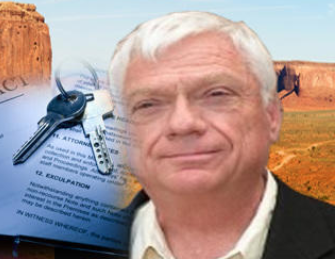 With over four decades of experience, I am well-versed in Arizona’s laws and statutes. I also know where we may run into red tape and, more importantly, how to work past it. Every lawsuit presents its own challenges, but fortunately for my clients, I excel in negotiations. My approach to litigation combines sound legal strategy with strong, decisive action. Whether your case involves document drafting, litigation, mediation, or arbitration, I will strive to design the legal plan that best accommodates your financial needs. When a dispute turns into a full-blown lawsuit, I stand at the ready to litigate on your behalf. Whether your lawsuit affects your home or work life, I will represent you with conviction. Involved in a contract dispute? Business breakup? Securities issue? Allow me to help. I regularly handle these and many other types of business disputes. If you’re looking to start a new business or grow an existing one, it pays to have another set of eyes review your legal paperwork. Since 1976, I have been handling title disputes, foreclosures, evictions, zoning issues, boundary disputes, and so many other real estate matters. Establishing an estate plan is a wise course of action no matter how young and healthy you may be. Get peace of mind by taking this important step. Every day, I face new challenges that keep my mind sharp and my work interesting. Even better — the solutions I build make life easier for my clients. Years of practice have taught me the importance of keeping my opponent on their toes. I’ve become adept at designing strategies they don’t see coming. Because I appreciate the unique circumstances of each case I handle, I am in turn able to develop solutions that adhere to each client’s individual needs. We were so fortunate to have you as our attorney. You are very professional and your counsel helped us make the right decision.You went beyond what was expected. As a result, we are very appreciative of your help! I feel that I owe no small debt of gratitude to Mr. Stanley for his inventiveness in the development of our litigation strategy, his doggedness in carrying it out, and the precision and clarity that characterized every filing that he made. For more than 40 years, it has been my privilege to guide my clients in Maricopa County - as well as other Arizona counties - through their various legal concerns. I find the work rewarding for a number of reasons — not the least of which is seeing the immense relief that a client gets to experience after we’ve overcome a particularly stressful situation. Helping an individual client attain peace of mind is enough in and of itself to give my work meaning, but I will admit that another driving force behind my practice is effecting positive change in the local business community. I have always admired the work that business owners put into running their companies, and I enjoy taking each opportunity to help them establish, grow, and protect all that they’ve built. In addition to supporting individuals and businesses, I like to also think of my work as a means of helping families protect what’s most important to them. Through my real estate, estate planning, and probate services, I work to safeguard their homes, finances, and assets today and to prevent future complications that could jeopardize those things in the future. As I’ve developed my practice over the years, I have chosen to maintain a small law firm because I enjoy being personally involved in every aspect of my clients’ cases. Rather than passing off certain tasks to a paralegal or secretary, I handle every component of the work myself. That way, I know my client’s situation inside and out, and they know that their case is in good hands.